For years, one aspect of Unique Johnson’s personality hindered her in school. “I’m a very quiet person and so I’m very shy at asking for help because I’m afraid someone is going to laugh at me cause I don’t understand it like everyone else,” Johnson says. She’s a high school freshman, and since she was in fifth grade this shyness in asking for help meant she never earned anything higher than a C. In fact, mostly she earned Fs. Her ISTEP+ score always hovered on either side of passing, and in seventh grade she had to repeat two classes because of her failing score. When she started her freshman year at Fishers High School, this trend continued. But second semester freshman year, things changes and Johnson received an A on almost every test she took. The change? Johnson transferred to Options Charter School, a school where a lot of the students have stories similar to her own – maybe they fell behind in a traditional school, got kicked out or are struggling with personal or emotional issues and need a smaller environment to succeed academically. It’s a school where students and teachers call each other by first name only, and students spend 30 minutes each day talking one on one time with a teacher – to catch up and make sure they’re on track. Principal Michelle Walden says this helps students feel more comfortable. “If they feel like they belong here and they feel like they own it then they start to believe in education again and believe in themselves and we see achievement,” she says. The gradual achievement Walden talks about is hard to measure. 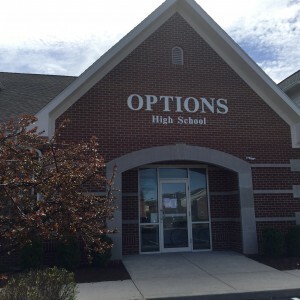 Options was one of two failing schools that went before the State Board of Education in March. Hoosier Academy Virtual Charter School is the other one. They both serve a similar population of students and don’t easily fit in the state’s A-F accountability model. Because A-F grades are calculated by comparing student scores in a school to each other, the low score of one student at a big school won’t bring down the school’s grade. But at a smaller school like Options, where most kids are starting from a lower vantage point, an F grade is almost inevitable. But Mike Gustin, President of Options Charter School, says despite failing grades for the schools, most students show improvement from the moment they come through the door, something some state board members recognize. At the March board meeting, the board voted to let both Options and the virtual charter school show improvement over the next year before coming back to the board and considering a consequence. Most of the board acknowledged these schools serve unique populations, but member Gordon Hendry says it’s not fair to let these schools off the hook from accountability for a year when other districts including Indianapolis Public Schools don’t get the same treatment. “It seems to me a little disingenuous to hold those schools and the district accountable when many of the kids have similar if not the same issues that these charter school kids have,” Hendry says. Hendry says he voted against giving the schools a year off from consequences because he thinks the authorizer of these charters, Ball State University, needs to help these schools succeed and be held accountable if they don’t. While Walden and Gustin believe there should be a different system that applies to schools like Options, that’s not possible under federal law. The State Board of Education does have flexibility though in deciding how to address the failure; they could enlist the authorizer to provide services for these students based on struggles, like mental health services, or have state board staff work with the school on a strategic plan. It’s all new territory for the board, its staff and the Department of Education to figure out. But for students attending these schools, like Unique Johnson, failure is not the dominant theme of her education anymore.